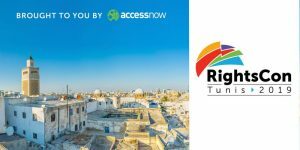 Access Now is excited to bring the eighth edition of RightsCon, the world’s leading summit on human rights in the digital age, to Tunis, Tunisia. RightsCon is where human rights experts, investors, business leaders, technologists, engineers, activists, and government representatives from around the world work to build strategies, create partnerships, and drive large-scale, real-world change in our digital world. From June 11-14, 2019, RightsCon Tunis will be a bustling hub, located at the Laico Hotel and the Palais des Congrès, right next to the city’s Human Rights Square, and just a few minutes’ walk from the heart of downtown Tunis. Check out our interactive map of the venue here.